I’ve talked about the Oblate Library in Florence recently since it was a pleasant and unexpected discovery just a few months ago. The library organizes many events so here is a new post to tell you about some of them. From March to June, the library will offer free guided tours to the former convent of Oblate, where it is located. Tours are in Italian and take place on March 6th, April 3rd, May 8th and June 12th. The meeting point is at 4.30 p.m. in the main cloister in Via dell’Oriuolo and the tour lasts about an hour and a half. 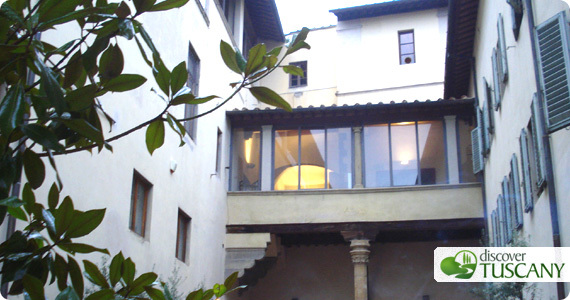 During the visit you discover the history of the building, the stories about the convent and the Oblate Order. Many legends and views make the visit pleasant. In addition, with the ticket you have a discount for breakfast at the Oblate cafè on the second floor. Another great news is that the Oblate Library once again will be open at night! From Tuesday to Saturday hours are 9.00 a.m. until 12.00 a.m. – midnight! You can go there to study or read local newspapers or simply relax reading a book. I strongly suggest you go once. If this is not enough, the Oblate cafè organizes thematic happy hours and dinners, animated with music, readings and tastings. If you can make it tonight, I highly recommend the musical happy hour with a performance by the Spitilli Jazz Trio.